Flight over Thailand celebrates part of Amy Johnson’s flight from London to Darwin, Australia. Amy arrived at Rangoon, Burma on Tuesday 13th May 1930, and flew on from there to Bangkok, Thailand. In the same week she reached Singora, Thailand and flew onto Singapore on the 18th. The artist wanted to celebrate this part of Amy’s journey as her birthday shares the same date as her landing in Singapore. The moth is decorated with a hint of Art Deco, in the style of Clarice Cliff, another pioneering lady of the 1930s in the field of design and decoration. Susan is a versatile West Country freelance artist and enjoys taking a variety of creative commissions. 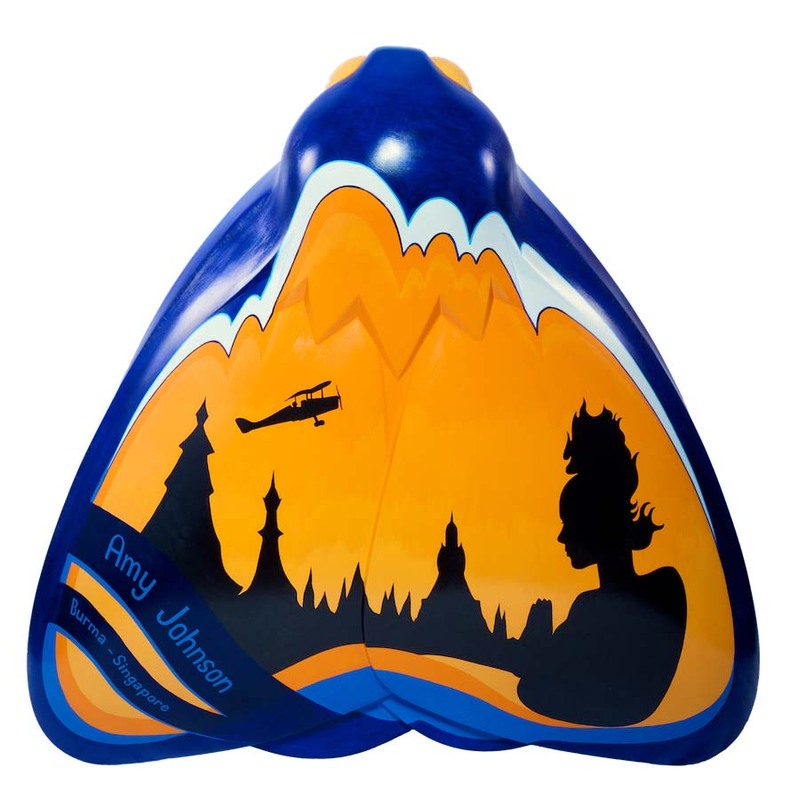 In 2015 she designed and painted a Shaun the Sheep ‘Another One Rides the Bus’ for Shaun in the City trail in Bristol, and designed and painted three Barons for Salisbury and Lincoln Barons trail and a Dragon for Taunton Deane. She has also worked on a collaborative project with Somerset Film for Somerset Carnivals, which include creating animations, designing costumes and taking part in the carnival processions. Previous commissions include designing and creating public artwork, including seven large 3D plaques for Minehead Harbour wall in Somerset.